The Ehukai (meaning sea spray in Hawaiian) has become the next generation in OC1 innovation. In addition to its novel features and striking design, Puakea Designs has teamed with Ozone to take advantage of the most sophisticated manufacturing technologies available. 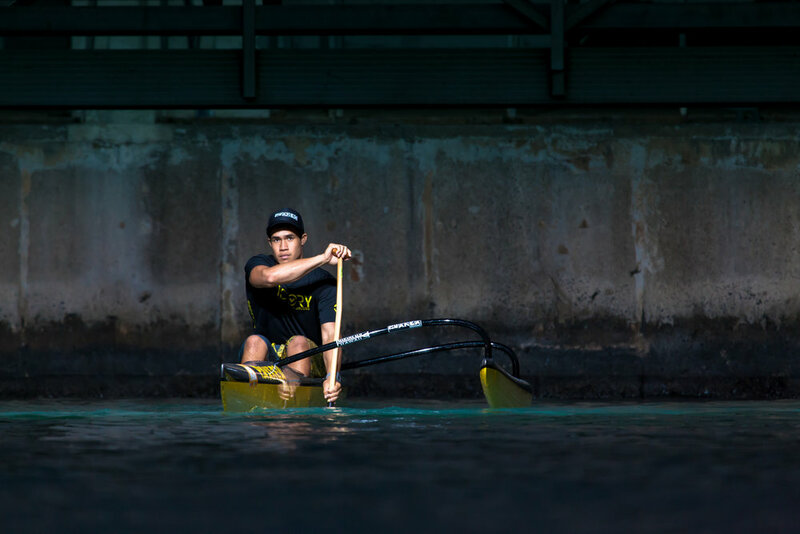 The Ehukai is a super strong yet light canoe that has been described by many as zippy and effortless to paddle. A very narrow bow and low volume allow for easy pick up and jump over of bumps. So while it picks up swell easily, it also maintains max speed while on the swell. This design enables quick acceleration and maneuverability on swells, with great glide in the flat. 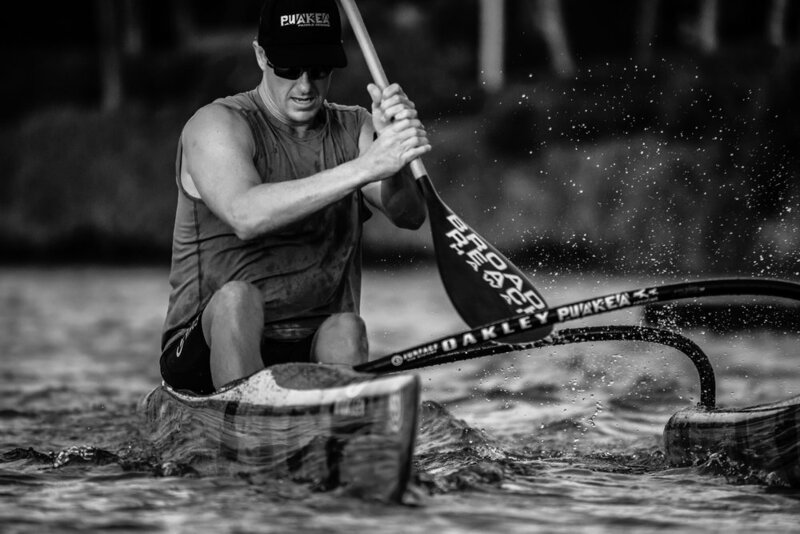 Its narrow foot well allows blade entry closer to the canoe, giving better leverage with each stroke. The Ehukai also comes with a foot well cover. In the surf, the cover keeps the water from filling the foot wells and weighing the boat down. In the flat, the foot well drains can be plugged to keep cold water away from your feet. The Ehukai also comes in the Pro Model at 16lbs. plus other upgrades! More info here. “Every few years in the world of outrigger, a new OC1 comes on to the market that changes the course of OC1 design throughout the industry. These designs are quickly noticed by other designers and the entire industry gravitates to similar designs. The first such design was the Hurricane. It was revolutionary in acceleration and speed for an OC1. Another such design was the original Pueo. It took downwind surfing on an OC1 to a whole new level. The next revolution in OC1 design is John Puakea’s Ehukai. 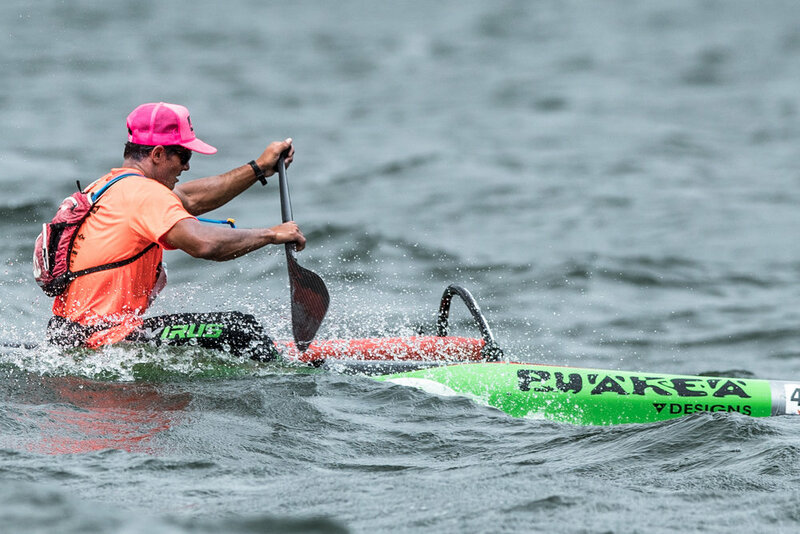 The new Ehukai seamlessly blends a canoe with flat water speed and downwind surfing excellence. The Ehukai’s major strength is it jumps waves easily and carries its speed much further then previous designs. This leads the Ehukai to really excel in the small to medium waves found in Hawaii and California. My flat water speeds are noticeably better in short burst and over long distances. 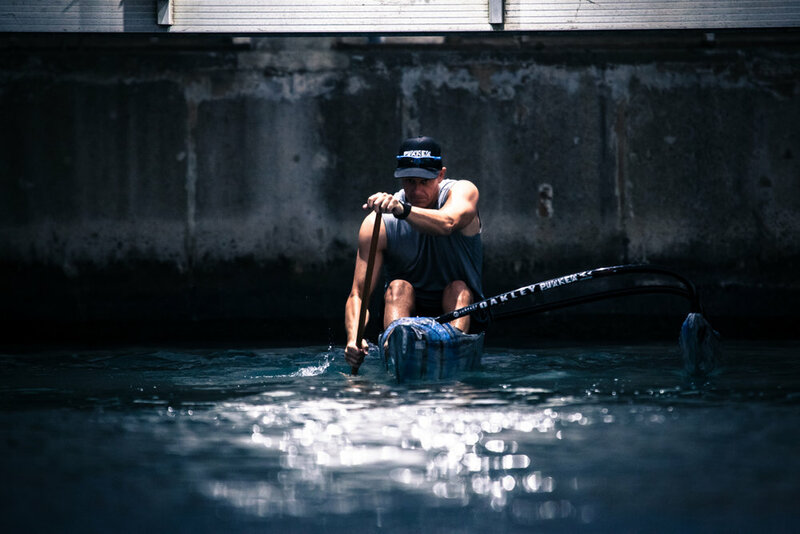 In big surf the canoe continuously wants to accelerate down and across the wave you are riding on, making paddling across the waves much easier and more rewarding then before. The quality of production is as impressive as the design of the canoe. The new manufacturing process is second to none. The boat is noticeably stiffer, and more durable then pervious canoes. For those of us that use their canoes often, or load and unload off our vehicle often are very grateful. Waterline: 18 ft. 6 in. Check out our Ehukai inventory here!